Our cartridge guns are designed for the application of pastes, gels, adhesives and most other assembly fluids. The 100A series air guns are suitable for use with industry standard 2.5oz, 6oz, 8oz, 10oz and 12oz size plastic cartridges. This gun range features a built-in adjustable air regulator with twist-on quick attach retainer system. The guns are supplied with a choice of retainers to fit standard 2.5, 6, 8, 10 and 12 ounce disposable cartridges. 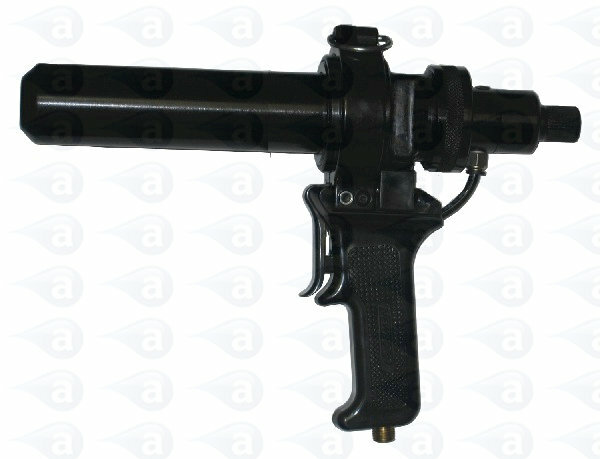 An air hose with thread connector to feed the gun can be ordered separately, if required. This range feature a built-in regulator. Air-powered 100A Series cartridge guns with metal threaded cartridge retainers. Cost-effective applicators with built-in adjustable regulator knobs to set material flow rate. With ergonomic handle and trigger assembly. Quiet operation and lightweight over long periods. The guns are robust and handle most liquids and pastes dispensed from them. The handle cap uses a hard wearing rubber gasket seal for the retainer that can be replaced after very long periods of use. Gaskets are held in stock. Keep the handle assembly clean and remove any grit or debris when required.